Autonomous Mind picks up the alarm raised after six police officers from the Metropolitan Police and Norfolk Constabulary searched a property and seized the computers and DSL router of a blogger for reporting the leak of the Climategate 2 emails. Looking at the outrage expressed on some other blogs, one is always mildly amused to see the learning curve tilt in an upwards direction, as yet another group of people are brought to confront the reality that our plod has gone off the rails. One is also saddened, however, by their failure to see the bigger picture. From the Peelian concept of the citizen constable, the police have distanced themselves from their origins and morphed into a state force, the primary purpose of which is to protect the state interest. 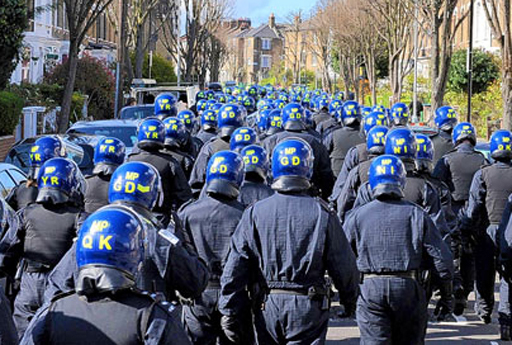 What we are seeing, therefore, is but one small – and relatively mild – example of a larger and more serious phenomenon, where virtually every day we see misuse or abuse of powers, as the police act against the public interest but in the interests of their state paymasters. The system, however, gains much of its power because the natural opposition is fragmented and disorganised, with disparate groups and interests rarely communicating with each other, or understanding that their apparently unique experiences are all part of a continuum - as in this case here in 2009. It is some consolation, though, that there are some more people who understand that the plod have become a force for evil. But only when we all join together to express that view will the plod have cause to fear us. For, as we keep saying, there are more of us than there are of them. Divided as we are, though, they pick us off.